This week I was featuring Ethiopian Sidamo, and have SOLD OUT on the Roast to Order for that particular coffee. You’ve gotta be quick. We’ve got some rockin’ coffees in, don’t miss out! 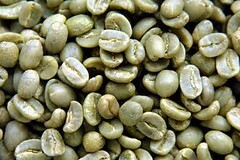 I have also sold an additional couple of pounds of the Ethiopian Harrar–Fantastic Blueberry. Blueberry in the cup, blueberry in the aroma…with a *hint* of chocolate as it cools. It’s a wonderful coffee! Yum!